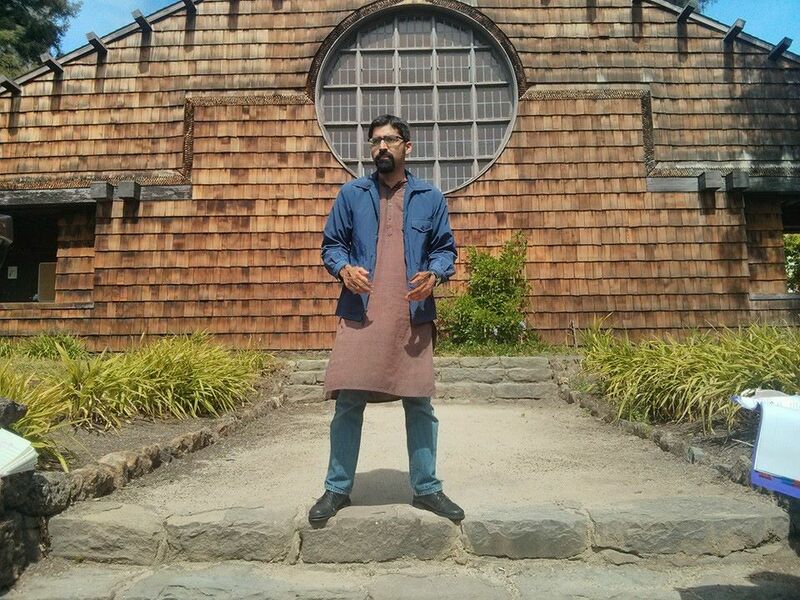 Anirvan Chatterjee shows tour participants sites of South Asian radical history in Berkeley. Photo credit: Mioi Hanaoka. For almost two years, the Berkeley South Asian Radical History Walking Tour has been traversing the streets of Berkeley, uncovering and recovering over 100 years of radical South Asian American history. The trek, led by Barnali Ghosh and Anirvan Chatterjee, is a two mile, three hour long tour where history meets storytelling and street theater. API Equality – Northern California interns and volunteers had the pleasure of accompanying Barnali and Anirvan on this tour. I had no idea what to expect going in; how radical could a tour be? As a tour guide myself, I was intrigued, confused, but mostly excited. Each stop we made, they told a new story. Of revolutionary students and radical labor organizing. But we didn’t just hear the stories, we experienced them. Barnali and Anirvan took us to where these momentous events took place, not just physically but emotionally. Through the usage of poetry, photographs, and performance, they were able to transform the space around us. We were at the rallies, the protests, the actions. More than just stories, Barnali and Anirvan were able to show how past struggles and victories impact current movements. How people who had everything to lose, rose up and fought back. And how bridges between communities were formed to empower and sustain these struggles. I couldn’t help but think of the similarities between this tour and our Dragon Fruit Project and our mission as API Equality – Northern California as a whole. These stories, from and by movement elders, are vital to not only record but also to disseminate. Where we use galleries, they use the streets. No matter the medium, it allows us to raise our voices and reclaim space. The values that we hold while doing our work is actualized by such projects, brought out of the realm of discourse into the physical world. The Berkeley South Asian Radical History Walking Tour brings history to the present, ensuring that these stories are never lost. With centuries of colonialism and white supremacy trying to suppress these stories, it is moments like this, these acts of resistance through preservation and education, that allow us to reclaim our lives. For more information on the Berkeley South Asian Radical History Walking Tour, visit their website and check out the Alliance of South Asians Taking Action (ASATA).